Hey everyone! Apologies for skipping a month - I had a lot of things going on in November, and once I had time to sit down and do the monthly post it was almost December already, at which point I figured it made more sense to wait until I could post the November post. You can check Fuzic for October rankings if you're interested in those. I'll try to make this a monthly thing again from here on. Not all event streams may be tracked for a particular event. If they're not listed as broadcasting an even in the TeamLiquid sidebar, they probably won't be picked up. Please leave a reply if you know of an event stream that wasn't included in the stats. 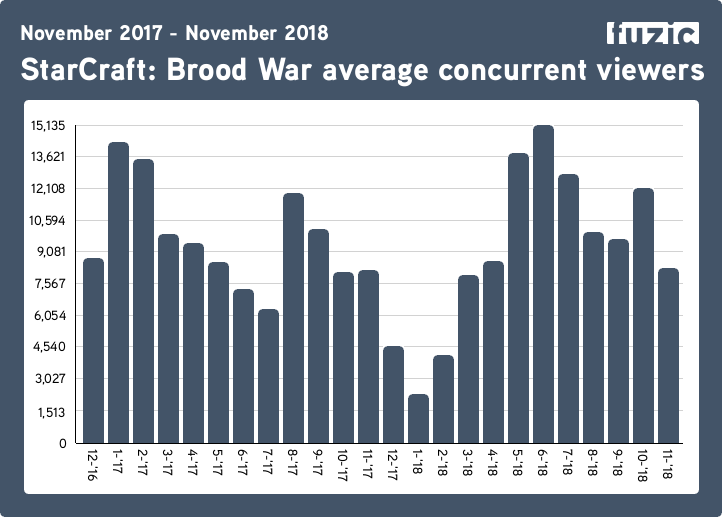 BW tracking was unfortunately broken in early 2018 (Dec 2017 - Feb 2018) which is reflected in the trend graph at the bottom. Suggestions and requests are always welcome! 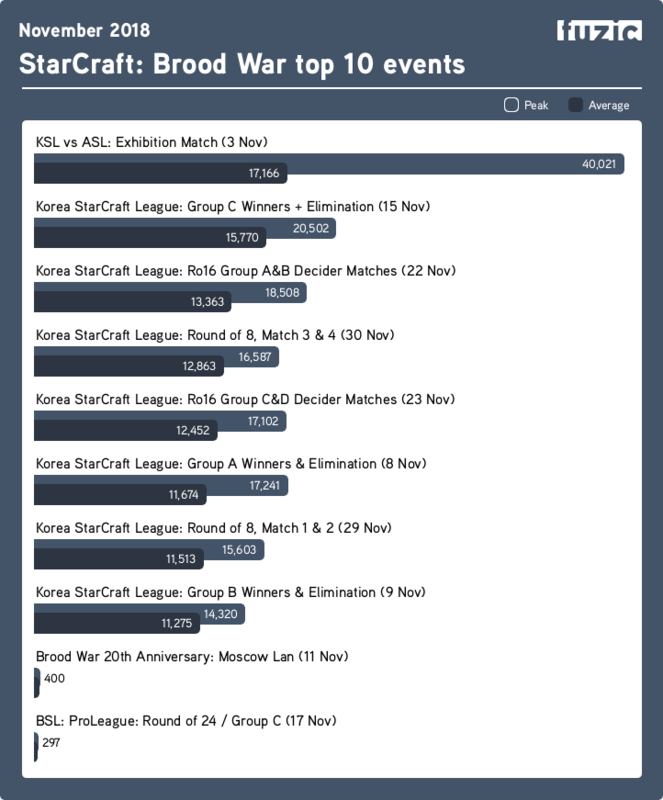 I run Fuzic - which collects statistics and rankings of StarCraft live streams - and these threads are a summary of the viewer numbers for the past month. 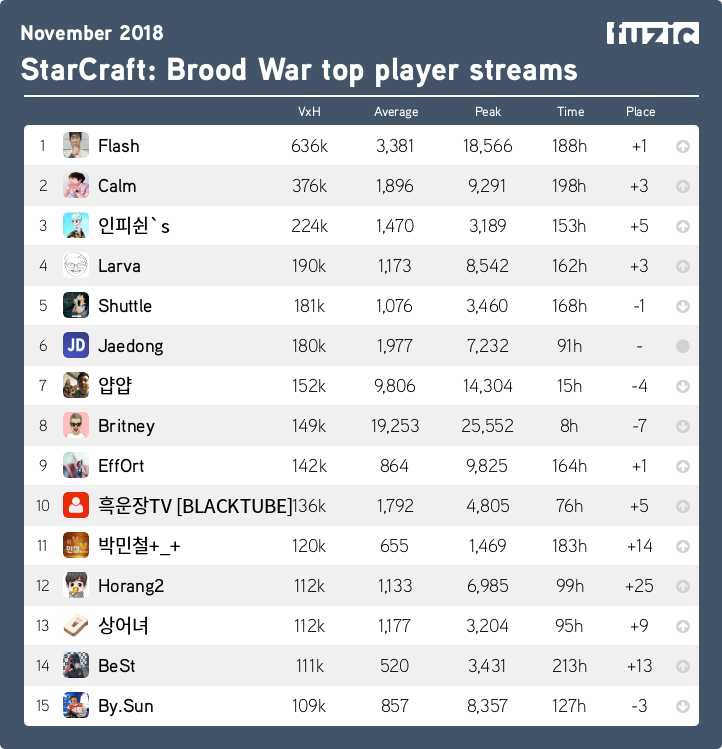 The rankings list any stream that is reported on by the APIs of the various streaming services (Twitch, Afreeca, etc). I have no way of verifying to what extent someone's viewers are legitimate, and therefore will not independently ban someone from the rankings. Please do not start a(nother) discussion about this in this thread. Hmm my stream doesn't show up under casters. Actually, my afreeca one does, but not the twitch. Thanks for flagging this, can you link your Twitch stream here so I can see if it should be marked as a caster stream? So why is Calm such a popular streamer? He was my favorite player back in the day but he's definitely not up to par any more. I guess he's just a really entertaining personality? I don't understand Korean so I don't really watch streams that much unless the player is in a game which Calm doesn't seem to play much outside of UMS. Glad to see he's doing well though. He is just always on, consistently. I live in Russia. I wear the fufaika, valenoks and the shapka-ushanka with the red star. I drink vodka straight from the samovar, and my riding bear plays on the balalaika. Consistent. Highly attractive. Maybe a good entertainer. He was a pretty popular player in KeSPA era too so that carriers over. Dunno if he had a personality to back it, but his looks may have helped carry that. More Schamtoo is always good! Love to see BW grow! because Calm is beautiful. Sorry @itsdaniel, he's even more beautiful than Kim Ga Eul.